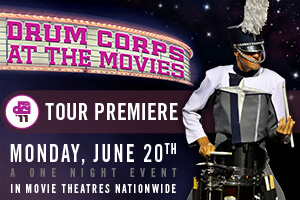 Drum Corps International's brand new cinema event, the "2011 Tour Premiere," is coming to movie theaters across America on Monday, June 20. Featuring the 2011 debut performances of the Blue Devils, Blue Stars, Bluecoats, Cadets, Carolina Crown, Cavaliers, Phantom Regiment and Santa Clara Vanguard, the one-night event will be shown in more than 400 theaters in 49 states. Tickets will go on sale through FathomEvents.com beginning Friday, May 20. View a complete list of participating theater locations. Learn more about the "2011 Tour Premiere."